In Food and Food Processing Industry, while making any granular or definite shape pieces, dusting is generated. Eta Dedusting Machine is a very efficient machine to remove such powders, dust, chips or broken pieces etc from such granules/granular material. While making any such product like mouth freshener, Jelly, Supari, Tablet, Seasonings, toffee, wafers, fried snacks or snack food, such dusting of flour or spices or any other powder is generated which needs to be removed before packing the product to improve your product quality appeal. It is also very useful for removing dusting or insects from agro seed, lentils, grains etc. to assist seed and grain cleaning process in cleaning plants. Sometimes in Colour sorting plants, if product is screened through Eta Vibro Screen® to remove dust before colour sorting it improves functioning of colour sorter. 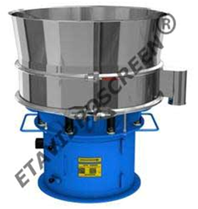 ETA Dehydrated powder Screener is used to remove lumps, fibers, foreign material etc. from dehydrated powder before packing. The machine is used for dehydrated onion powder, dehydrated garlic powder and dehydrated vegetable powder like Tomato powder, Potato Flakes and dehydrated fruit powder like Amala powder, Aamchur etc. ETA vibro Screen has special arrangement to prevent chocking of Mesh during screening process of dehydrated powder. ETA Dehydrated Product Grader is used to grade cut pieces of dehydrated vegetables & fruits, dehydrated garlic granules, potato flakes etc. according to sizes. Dehydrated Product is screened thru different sizes of Mesh to get different size of product. like means chips kibbles etc as per market requirement grade. Dry Fruit Grader is used to separate various dry fruits on size base. By using Dry Fruit Grader It is possible to get whole lot of same size which is necessary for better price realization in the domestic as well as export business. Eta Dry Fruit Grader is widely used to achieve better product quality of Cachew, Pistachio, Almond, Walnut etc. With the use of Dry Fruit Grader, separation process is done very efficiently. Dry fruits are screened through Mesh or perforated sheet of different sizes and as per the requirement. ETA Dry Fruit Graders are available in different models depending upon number of separations required. With Eta Dry Fruit Grader it is possible to get different sizes of dry fruits in a single process of classification. 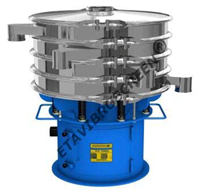 Eta Edible oil filter machine is used for removal of skins, foots, lumps, foreign material from edible oil. The machine is used to filter Sesame oil, Groundnut oil, Coconut oil, Palm oil, Rapeseed oil, Sunflower oil etc, particularly before main filtration process like filter press etc. ETA Edible Oil filters are available in different sizes as per the requirement. It is excellent online filter with benefit of continuous removal of solids/sludge and with reduced screen choking due to vibrations. Vibro Screens are used for Screening of Coffee powder, tea/coffee premix, Spray Dried items like Spray Dried Milk Powder, spray dried Soup Powders Etc. before Packing or Processing to Remove Lumps & Foreign Material to achieve uniform product with minimal sedimentation. The machine is also used to prepar tea powder for teabags. Eta Tea Screener is used for removing very fine powder to ensure clear product. is used to remove lumps, pieces, foreign material etc. from chocolate powder. The machine is available in various sizes as per the requirement. 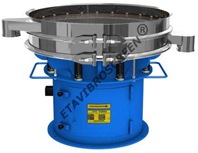 ETA Vibro screens are also used to filter chocolate paste. ETA Fruit Juice Filter is used to remove skin, seeds, foreign material, fruit fibers etc. from fruit juice to get filtered fruit juice before bottling/packing or taking to the next process. ETA Fruit Juice Filters are available in different sizes as per the requirement. Eta Fruit Juice filter is used to filter Apple juice, Amala juice, Mango juice or pulp, Pineapple juice, Orange juice, Alovera juice etc. Eta vibro screens are used for screening of FREE FLOW salt for removing large lumps and foreign material and theirby achive a cut off size of salt particle. Salt is screened thru specific mesh to get desired product quality with efficiency. 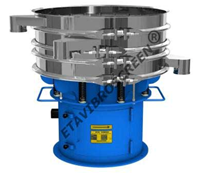 Eta vibro screens are used for grading of FREE FLOW salt in different particle sizes. Salt is screened through Mesh of different sizes as per the requirement. Salt graders are available in different models in SS 304 or SS 316 contact parts. 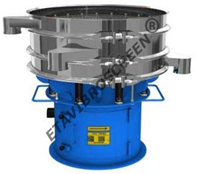 ETA Flour Screener/sifter is used to remove lumps, insects, over size material and foreign material from flour before packing or taking it to next process. It is used for Maida, Wheat Flour, Besan Flour, Rawa(Sooji) , Instant Mix powder, Rice Flour, Udad Dal Flour, etc. Off line siever which sifts the flour in lot of 10 to 15 kgs. On line screener which screens the flour continuously coming from a steady source. 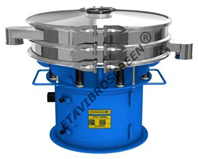 Eta Vibro Screen®s are used for filtering sugar juice in sugar mill where juice is to be filtered to remove fibres. 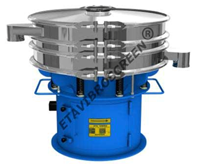 Eta Vibro Screen®s are also used for precise Grading of Sugar seeds into Different Grades as per size to achieve better product quality. Precise Grading of sugar seeds is also necessary for controlling input Granular Sugar for production of Sugar Cubes. With the use of Seed Sugar Grader, separation process is done very efficiently. ETA Seed & Granules Dewatering Machine is used for removing majority of water from agro seeds like sesame, after hulling or washing. It removes un- bonded water from Seeds & Granules faster than Gravity dewatering process. In modern Agro processing industry where any agro product is washed and dried removing excess water greatly enhances drying process saving useful fuels in drying. Spices Powder Screeners are used to remove lumps ,Un-ground pieces and foreign material from the powdered spices. Ground Spices are screened thru specific Mesh to achieve desired product. Whole Spices Grader is used to separate various Spices on size base. By using Spices Grader It is possible to get different grades of any whole spice and condiments like, coriander, mustard, pepper, cumin, fennel, clove, cardamom, cinnamon for better price realization in the domestic as well as export business. Eta Spices Grader is widely used to achieve better product quality. With the use of Spices Grader, separation process is done very efficiently. Spices are screened through Mesh or perforated sheet of different sizes shapes as per the requirement. ETA Spices Graders are available in different models depending upon number of separations required. With Eta Spices Grader it is possible to get different sizes of Spices in a single process of screening.